Cleaning and maintaining your own windows and window furnishings can be a big job, and be both tedious and time consuming-it can sometimes be more than you can handle. Los Angeles Carpet Cleaning .us provides top-quality professional window cleaning services for your home or office. When well maintained and clean, windows add a welcoming touch of elegance to your home, creating a pleasant and inviting atmosphere. Windows are gateways to the outside world. They bring nature into your home, letting in glorious sunshine, gentle breezes and the natural scents of outdoors. At the office, windows are a statement of your business culture. When windows are looking smart and immaculately kept, you make a huge impression on your clients and visitors. Window furnishings are made of a variety of materials such as wood, metal, vinyl, natural fibers, synthetic fibers, and others. Our expert technicians choose the best window cleaning solution by selecting the most effective cleaning procedure for each type of material. To begin the window treatment Los Angeles Carpet Cleaning .us will send a window crew to your home. They will gently remove all of your windows' furnishings and drapes and bring them to our premises. Once there, your window furnishings will be treated and serviced with the utmost care. When the job is done, we'll return to your home and reinstall them at no extra cost. Sometimes drapes may be cleaned where they hang. In these cases we use either a low-moisture hot water extraction method or a dry cleaning process for safely cleaning even the most delicate of fabrics. Alternatively, we can "dust down" your drapery, thereby removing odors and contaminants-leaving your drapes sunshine fresh and clean. We gently lift out soil and stains and get your furnishings dry within minutes. Before you know it your draperies will be like new-pleasing to the eye and adding a touch of dramatic beauty to your windows. We invite you to contact Los Angeles Carpet Cleaning .us -the window cleaning company of choice in the Los Angeles area. 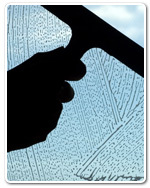 Use a handheld vacuum cleaner to clean window screens and remove dirt from frames and window tracks. Glass - Wash the outside of the windowpanes from left to right and the inside from top to bottom. This way, if streaks form you'll know which side to do over. Crumpled newspapers give the best cleaning but make your hands black. You can try cotton rags, percale pillowcases, a cloth diaper or a coffee filter (works great on mirrors too). Windowsills - Spot problems - try a cloth dipped in a mixture of rubbing alcohol and water. Screens - Cleaning - Lay screen against an outside wall or fence. Rinse thoroughly with a hose to remove most of the dirt. Scrub with a nylon brush and a mixture of dish detergent and water. Dry with an old towel. Metal or Plastic Blinds - Hang the blinds on self-stick hooks in your shower and use a hand-held shower hose and dishwashing liquid to wash and air dry. Drapery - Tie a fishing sinker or similar small weight to the ends of curtain drapery cords to keep them from flapping around. If your drapes are backed with the rubber-type insulator and part of the backing tears, replace it with the caulking compound used to seal around bathtubs and windows. Mend your torn drapes with iron-on interfacing.